Yesterday was a bit rainy, which, for guests in our bed & breakfast in Freeport Maine, usually means shopping at the Freeport outlets and shops. However, this time the guests had done all the shopping they wanted for the moment, and were looking for a great rainy day sightseeing adventure. 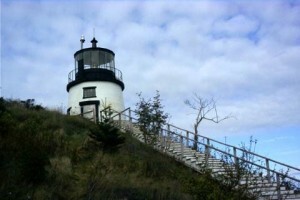 One of our favorite suggestions is a day trip north up US-1, and the Owls Head Peninsula, on Penobscot Bay. Turning north from Brewster House, US-1 passes through Brunswick and Bath, then Woolwich and then Montsweag, on to Wiscasset, Damariscotta and Newcastle, Nobleboro, Waldoboro, and Thomaston, before reaching Rockland, where you’ll turn right on Maine Route 73. Nearly all of these towns have interesting places to visit, and side trips down the peninsulas and islands take you to Bailey Island, Harpswell, Popham Beach, Five Islands, Boothbay Harbor, and Pemaquid Point and yield the beauty of sandy beaches, old forts, beautiful harbors and magnificent lighthouses, though some may not be quite the same on a rainy day, as you would see on a bright, sunny day. If you enjoy lighthouses, you should stop in Rockland for a visit to the Maine Lighthouse Museum for a view of their extensive collection of lighthouse information and artifacts. Turning down Route 73 into Owls Head, be sure to visit the Owls Head Transportation Museum. In addition to their huge display of collections of aircraft, automobiles, motorcycles, carriages, bicycles, and engines, they have special events throughout the year. 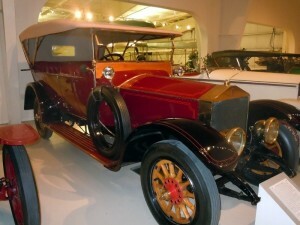 From fly-ins to drive-ins, to antique auto auctions, there is something for everyone. What a wonderful way to spend a rainy day! If the weather clears (or if you want one of those mystical photos of the lighthouse appearing through the fog, clouds, or rain), go the short way down Shore Drive to Owls Head State Park, where you’ll find Owls Head Lighthouse. The view of Owls Head Bay to the right is gorgeous, but when you climb the steps to the base of the lighthouse, you suddenly see that all of Penobscot Bay is revealed over the hill! What a magnificent sight! If time and weather permit, go south on Route 73 to Saint George, then turn left on Route 131, through Tenants Harbor to Port Clyde. Near Port Clyde, Marshall Point Lighthouse sits at the entrance to picturesque Port Clyde harbor, where you’ll find photographers waiting for the sunset to take their photos. You may recognize Marshall Point lighthouse from the film, Forrest Gump. After returning to US-1 via Route 131, be sure to stop at Moody’s Diner in Waldoboro for dinner (they serve everything from a grilled cheese sandwich to a full lobster dinner) or at least for some of their wonderful blueberry pie! It’s a genuine, old-fashioned, Maine diner experience. From that point it is less than an hour back to Brewster House Bed & Breakfast in Freeport.